Do you ever feel as if a door is open somewhere and the enemy has moved into your house? Everything you say is misunderstood and everything anyone else says is misunderstood by you. Anger flares or silence reigns. Tension gets thick enough to cut up and serve for supper. But…who opened the door and how do we get it closed? God’s word is sure and He’s promised that if we make Him our dwelling place, He will keep the enemy at bay. Let’s take a look at this verse. It is pregnant with covenant blessings. KJV – adversity, affliction, bad, calamity, distress, evil, grief (-vous), harm, heavy, hurt (-ful), ill (favoured), + mark, mischief (-vous), misery, naught (-ty), noisome, + not please, sad (-ly), sore, sorrow, trouble, vex, wicked (-ly, -ness, one), worse (-st), wretchedness, wrong. <7489> ‎ra`a` (raw-ah’); a primitive root; properly, to spoil (literally, by breaking to pieces); figuratively, to make (or be) good for nothing, i.e. bad physically, socially or morally. So ‘evil’ is the enemy, the one who thinks he is Most Important and he thinks he can See and Understand everything, when in comparison to our God, he is Insufficient. 579 (aw-naw’); a primitive root [perhaps rather identical with OT:578 through the idea of contraction in anguish]; to approach; hence, to meet in various senses: KJV – befall, deliver, happen, seek a quarrel. <578> (aw-naw’); a primitive root; to groan: KJV – lament, mourn. BEFALL: Evil (the enemy) can’t overtake me because God, the Most Important Leader is protecting me with His Strength and Power and preserving my Life. 5061 (neh’-gah); from 5060; a blow (figuratively, infliction); also (by implication) a spot (concretely, a leprous person or dress): KJV – plague, sore, stricken, stripe, stroke, wound. <5060> ‎naga` (naw-gah’); a primitive root; properly, to touch, i.e. lay the hand upon; by implication, to reach, violently, to strike (punish, defeat, destroy, etc. ): KJV – beat, (X be able to) bring (down), cast, come (nigh), draw near (nigh), get up, happen, join, near, plague, reach (up), smite, strike, touch. PLAGUE: An Action taken to Retaliate that will Be Seen. Here is another wonderful promise. If we make the LORD our dwelling place, the enemy cannot retaliate against us and end our lives. While we may experience attacks, he cannot overtake us when we are hidden in Him. <7126> (kaw-rab’); a primitive root; to approach (causatively, bring near) for whatever purpose. COME NIGH: We’ve been set apart as Holy unto God, and because of this, the Insufficient enemy who is pretending to be the Chief and Most Important person cannot Circle Round Behind me or my family to cause harm. 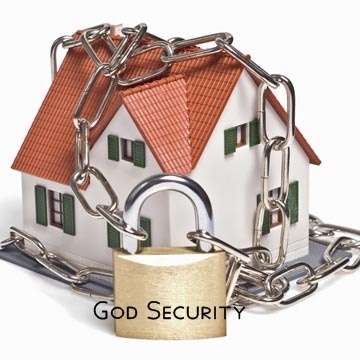 God, the Chief Head, is there protecting me and all of His Family, because we are His House. 168 ‎’ohel (o’-hel); from OT:166; a tent (as clearly conspicuous from a distance): KJV – covering, (dwelling) place), home, tabernacle, tent. <166> ‎’ahal (aw-hal’); a primitive root; to be clear: KJV – shine. DWELLING/HABITATION: Because we have made Him the One we give attention to, and Him the One we follow, He gives us Revelation and discernment of the enemy so we don’t fall prey to his Instructions or Urging. “Jesus said— ‘if you abide IN ME and My Words abide in you, you shall ask what you will and it shall be done for you.’ (John 15:7) Another level of ‘say’ is that as you speak My words of love, encouragement, truth based in love, no evil shall befall you. The plans of the enemy to separate and destroy your marriage will be thwarted. Abiding in Me is that complete surrender place where I am your supply for all things. What I say, you will say. What I do, you will do. Constant submission in love to Me. I am your Redeemer, the Restorer of the breach in your marriage and in your heart. Look to Me and live. Trust in yourself and watch havoc work its way into your home. I am leading you to a place of dwelling in Me that you’ve dreamed of. It is here waiting for you. Trust Me to get you there. You are already experiencing victory, but there is much more to come. I am not a god who lies. My words are true. You will stand together as one in My will. It will be glorious. You’ve only touched what I am about to do. My ways are full of twists and turns. It keeps you from seeing direction so that you have to depend on Me. Otherwise you would run to the goal before the circumstances are right and your victory would end in defeat. Every twist, every turn equips you for the victory. Yes, you need to be equipped for victory. Without My equipping victory can be short-lived.